The PawPledge folks are holding an adoption drive this weekend – 17/18 Nov, 11.30am to 6.00pm. Plus, don’t forget to support their merchandise sale. Yesterday’s Washington Post covered the rescue of hundreds of ill-treated dogs and puppies – victims of greedy breeders in the puppy mill trade. It is estimated that this case is probably the largest of its kind to come ot light, both at the state and country level in the US. The Washington Humane Society is one of the many local animal-rescue groups helping to care for the rescued dogs. Why do puppy mills exist? It is because of human greed and vanity, fuelled by consumers’ ignorance and condoning. And yes, the puppy mills have equally exploitative sisters in kitten mills. Purebred kitties seized from a breeder in the States. Don’t think it’s something that doesn’t happen in Singapore. It does. On this blog entry is a sample list of breeder/pet trade news in Singapore, and none of it is positive. While we’ve not read about undercover investigations by local animal welfare groups, one thing is for sure: puppy mills DO exist in Singapore, as surely as greedy pet sellers exist, and pet-buyers support the business. How can you BUY a friend? Have you ever wondered if your pet supplier is an ethical businessperson? How do you reconcile yourself with the possibility of your best friend’s mum and dad being exploited to make puppies – doesn’t their well-being mean anything to you? Please, adopt, don’t buy. Do not breed or buy while shelter animals die. Some of the adult dogs arriving at the Montgomery County animal shelter Thursday acted like newborn pups with splayed legs, wobbly as they tried to walk. They had never been on solid ground. At first, they didn’t know how to eat from a bowl, so accustomed were they to the troughs at the puppy mill in southwestern Virginia from which they had just been rescued. Several had matted hair around their eyes and couldn’t see. The pads of their feet were sore or cut from being confined to wire cages. When word of the dogs’ plight surfaced this week on the Web site of the Humane Society of the United States — that officials in Carroll County, Va., had seized nearly 1,000 dogs from a suspected puppy mill — reaction from animal lovers was immediate and intense. Volunteers from the Washington region joined others from Florida and New York who streamed to the rural town of Hillsville near the North Carolina border. Families began calling to ask when they could adopt the dogs. Donations rolled in; PetSmart sent a trailer full of kibble and other supplies. “It’s been incredible,” County Administrator Gary Larrowe said of the outpouring. Larrowe had declared a state of emergency after hundreds of dogs were found living in filthy cages late last week. Officials said they think it is the largest suspected puppy mill ever found in the state. Volunteers from a local animal rights group said that when they visited dog breeder Junior Horton’s property in undercover fashion, they were overwhelmed by the numbers of dogs crammed into wire cages in several outbuildings. In one, whelping mothers lay with their distended bellies under heat lamps, waiting to give birth. The dogs appeared to have food and water, but feces under their cages had not been cleaned. Larrowe said Horton had a local license to run a kennel for 500 animals and had exceeded that twofold. He also did not have the required U.S. Department of Agriculture license that would allow him to sell dogs to commercial operations such as pet stores. Carroll Sheriff H. Warren Manning said that the matter has been referred to the commonwealth’s attorney. A decision on whether to file criminal charges against Horton is expected within a few weeks. A man who answered the phone yesterday at Horton’s Pups identified himself as Tim Bullion, Junior Horton’s employee. “We just ain’t talking to any press right now or no newspapers,” Bullion said. Representatives from animal welfare groups from the Washington area began making their way back home Thursday and yesterday with dozens of puppies and dogs awaiting homes. In Montgomery, animal welfare advocates drove the puppies five hours from a staging area in Virginia to a shelter in Rockville. Fifteen workers helped to get the dogs situated in large dog runs with heated floors partly lined with blankets and towels for sleeping. Some of the animals were reluctant to come out of their carriers at first, cowering when the doors opened. One young female poodle would not budge. A 4-year-old Pekingese “spent her whole life in that crate, delivering litter after litter after litter,” said J.C. Crist, president of the Montgomery Humane Society. The animals were groomed and vaccinated. They also got names — Pearl the poodle, Snook the Puggle and Red Sox, a Boston terrier. In Fairfax County, animal control officers returned late yesterday with 32 dogs of all ages, including some that were pregnant. They said the dogs needed to be examined and given a rabies vaccination, if appropriate, before they can be adopted. The dogs — which were distributed among shelters in Fairfax, Alexandria, Arlington County and the District — won’t be available for adoption until at least next week, officials said. 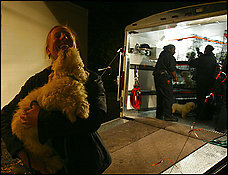 Loudoun County officials also brought back some of the dogs. It was dark outside the Fairfax shelter yesterday and dripping chilly rain when the dogs arrived, and the police trailer they arrived in was emblazoned with an ominous label: MAJOR INCIDENT SUPPORT UNIT. But inside the trailer, the poufy white Lhasa apsos and curly-coated poodles looked joyous, leaping up and down on the pastel-colored towels that lined their cages and yelping to the shelter staffers and police officers who cooed over them. Animal welfare advocates say that puppy mills — unlicensed, illegal facilities that breed large numbers of purebred puppies — have proliferated as demand has increased and dogs have become easier to buy, over the Internet or through newspaper ads. Such animals are often kept in small wire cages, receive inadequate veterinary care and are not domesticated, advocates say. “It’s a huge problem,” said Tara deNicolas, a spokeswoman for the Washington Humane Society. Although large puppy mills are often found in Midwestern farm states, her group recently rescued three beagles from an illegal operation in Southeast Washington. Stephanie Shain, director of the Stop Puppy Mills campaign for the Humane Society, said her group started an investigation of puppy mills in Virginia last year after receiving calls from people who adopted animals from pet store that were unhealthy and died. Undercover investigators from animal rights groups visited Horton’s property several times between April and August and made hidden-camera video recordings of hundreds of dogs kept outside in wire containers. The dogs were all manner of breeds, including Yorkshire and Boston terriers, Cavalier King Charles spaniels, poodles and Jack Russell terriers. The activists showed their video to Carroll officials, who began their investigation. Juan Lopez, director of rescue operations for the Montgomery Humane Society, said he was stunned to see where the hundreds of dogs were penned up, in rabbit hutches on stilts lined along a sloping valley. Staff writer Karin Brulliard and staff researcher Karl Evanzz contributed to this report. I found this letter in TODAY amusing in a sad way (note emphasized paras) – it is scarily accurate in reading Singaporeans and at the same time sheds some light on part of the problem our homeless animals face in trying to eke out a living among us. We are so intolerant of our fellow-men — people who have come here to do the dirty jobs singahpor pansies can’t even bear to contemplate — how can we have the generosity of heart to be compassionate for the non-humans among us? Cats have died just being. Plus, the government is happy to bend over backwards to accommodate whingers… so while the behavior of the woman may not be representatitve of Singaporeans, it’s not all that uncommon either, to the point that two members of Parliament, Dr Mohd Maliki Osman and Mr Lim Biow Chuan have said that Singaporeans are too complaint-happy, too reliant on the government for resolution, and too intolerant. How much lower can we sink? At a meeting recently with a Member of Parliament and local residents, a well-dressed Singaporean woman raised the “problem” of foreign construction workers. When pressed, she admitted that they had never done anything to her but seeing them in her area disturbed her. A senior policeman pointed out that foreign workers in the area rarely commit crimes and that most of the culprits were pub crawlers. But no one wanted to drop the idea that foreign workers were trouble. The policeman had no choice but agree to keep a closer eye on them. •Too many of them live in one apartment. Here’s a thought: Would Singaporeans be able to afford to live any better if they were paid the same wages as some foreign workers are? • Curry smells. Doesn’t our food (fried fish, belacan and durian) smell, too? Are we so parochial that we only object to smells that are different from our own? • They hang their clothes outside to dry. A walk around any housing estate will show the many laundry poles outside our flats, attesting to the fact that Singaporeans hang their laundry out to dry as well. • They hang out in large groups and that’s scary. I think our prejudices are far more frightening than a group of men finding company in numbers when far away from home. • They don’t speak English. It’s unlikely that they can afford the time or money to take English language classes. If this is really an issue, the Government could make it mandatory for employers to provide all foreign workers with two-hour English language classes every week. It seems perfectly fine for foreign workers to work long hours with low wages to construct the buildings that drive our economic boom. But many of us fail to remember how difficult their daily lives must be. This mindset does not speak well for multiculturalism. It isn’t enough for Singapore to produce tourist brochures showcasing us as a harmonious, multi-ethnic society. This attitude needs to be part of our daily lives before it becomes true. IF EVER an HDB block of flats represents Singapore’s current mix of inhabitants, mine would surely be it. I live in a part of Singapore that does not fetch sky-high property prices, nor does it attract parents who want to be close to choice schools. But I do find it fascinating being a Singaporean amidst people who come from such distant lands to make a living in my country. Next door to me live a posse of shipyard workers from India who wake up at 6am and return home exhausted at 8pm every day. At least six of them are crammed inside that little flat. Next door to them is a single Chinese man who I assume is a local because he greets me in Singlish. Next to him is a family of five, two young boys, their parents and another man who sounds like he is from Thailand. I am not sure because they usually do not make eye contact with me. When I tell people where I live and that many of my neighbours are foreigners, they baulk. “You better lock your door properly!” said my ever-paranoid mother. “Aiyoh, not safe right?,” added another curious relative. At first, I admit that I did find it quite annoying. Walking past a household full of men is not always a feast for the senses. The mix of sweat, food and unwashed clothes hits you like a sudden, unpleasant wave. And the aroma of their pungent curries can be overwhelming at times. When we bump into one another in the lift, I also wish they would be more polite and not stare at me. Perhaps a little too indignantly, I answer “yes” and then bury my head in my book. In another corner, a group of Chinese mothers squat by their babies and eat kwa chee (melon seeds). I watch them throw the shells on the ground and feel like telling them not to litter. But I don’t and go back to watching the kids. Reading the many complaints about foreigners in the press and on Internet forums got me thinking. Why are we so irked by foreigners? Is it really them? Or does the problem lie with us? Let’s look at the numbers. Our population stands at about 4.7 million people. Of these, some 1 million are foreigners, not including PRs — all of us living cheek by jowl on just over 700 sq km of land. And this number is set to swell — the Government has said it expects the population to grow to 6.5 million. Since Singaporeans can’t add to the head count all by ourselves, the result is this new social situation. If we invite foreigners here so they can boost our numbers and economy, are we being unreasonable in expecting them not to live in our neighbourhoods, go to our shopping centres or hospitals and take our buses and trains? But what a strange thing to expect! Many of the people who clear our rubbish bins are foreigners, as are those who work in our shipyards. Many caregivers, the very people who help look after our loved ones are — you guessed it — foreigners! It might help if we make the effort to understand how people behave. Yes, it is hard to get used to a foreigner’s mannerisms and habits but isn’t it the same when Singaporeans are abroad? Our need to be who we really are does not change just because our location does. No matter how fancy a four-room flat may seem compared to a hut in a foreign country, we can’t expect foreigners to give up what they like doing — whether it be talking loudly, cooking strange food or tossing their rubbish about nonchalantly. I do, however, recognise that making a logical argument doesn’t take away the resentment many of us feel. When I log on to online forums, there are many posts about “FTs” (foreign talents). Invariably, the posts centre on how they take away spots for our children in schools, our jobs and our seats on the MRT. These feelings are here to stay and with space getting tighter, the complaints will probably get louder. Sometimes though, our prejudices block us from being honest about our own failings. The lifts in my block constantly reek of urine. I’ve been curious to find out who the unmannered culprit was. One day, I caught someone relieving himself behind the letterboxes. I was certain it was one of “those” foreigners and was determined to make a complaint. But when I sneaked up to see who it was, I was surprised and disappointed. I knew the “urinator” — he was a friendly elderly man who lives in my block. He is also 100-per-cent Singaporean — I know this because we’ve spoken several times. Bad manners isn’t only confined to the guests living in our country. The hosts can be just as guilty. So the next time you start to complain about foreigners, take a good look in the mirror first. Crispina Robert is a freelance writer and editor who tries to make conversation with the Bangladeshi cleaners in her block. She hasn’t yet been successful because they don’t understand a word she says. In response to the hdb pet rules issue, a friend sent a letter to the papers about her dog’s story. Straits Times printed an edited version of the letter. I’m appending the original version for reference as well. I LIVE in an HDB flat with my spouse. Two years ago, we adopted Magnum, a mid-size mongrel. Magnum adapted very quickly to living with us. However, as he was an abandoned dog, he had anxiety issues when left alone. We are both working adults, so we did what we could to mitigate potential problems. Things were peaceful for the first six months. Then someone made an anonymous complaint to the Society for the Prevention of Cruelty to Animals. Magnum barked at the door – as is natural for dogs – when people passed by. This seemed to be the gist of the complaint. The complainant apparently did not want Magnum removed but was concerned about his welfare. We were keen to speak with the complainant to know what the real problem was and find a solution. However, we were told the complainant did not want to speak with us. Our hands were tied. Soon after that, the HDB told us an anonymous complaint had been lodged about barking from our flat. Again, the complainant’s identity was protected. We knew then we could not share our flat with Magnum any longer. It was heart-wrenching for Magnum to lose his home so soon after being abandoned. The HDB was concerned only about ensuring that Magnum was no longer in our home. We can’t help but wonder if that was how Magnum was abandoned in the first place. As responsible pet owners, we made sure that Magnum went to a good home. But what happens to pets of irresponsible owners when HDB officials come knocking? I am writing to share my story, and ask that the HDB implement reasonable rules so that problems relating to pets can be better managed, and promote good neighbourly relations. I live in a HDB flat with my spouse. Two years ago, we adopted Magnum, a mid-sized mongrel. Things were peaceful for the first 6 months. Then, someone made an anonymous complaint to the SPCA. Magnum barked, as is natural of dogs, at the door when he is aware of people passing by. This seemed to be the gist of the complaint. The complainant apparently didn’t want Magnum removed but was concerned about his welfare. We were keen to speak with the complainant in order to know what the real problem was and to find a solution. However, we were told the complainant didn’t want to speak with us. Our hands were tied. Soon after that, we were notified by HDB that an anonymous complaint has been lodged about barking from our flat. Again, the complainant’s identity was protected. The HDB was only concerned that Magnum was no longer in our home. We can’t help but wonder if that was how Magnum got abandoned in the first place. As responsible pet owners, we made sure that Magnum went to a good home. But what happens to pets of irresponsible owners when HDB comes knocking? Irresponsible owners probably abandon their pets when problems arise, like the large dogs affected by the AVA rules even though abandonment is a crime. Surely, the HDB has to bear its share of responsibility in such cases. Since Magnum left us, our neighbourhood has lost that warm welcoming feel – who knows which of our neighbours are unhappy with us for some reason? Worse yet is their preference to make anonymous complaints to the HDB than talk to us about it. It really doesn’t help that the HDB has unrealistic pet-rules, and is happy to entertain anonymous complaints without verifying their merit.